AFTER withstanding violent protests and attacks on staff and its small car factory in Singur, West Bengal, for almost two years, Tata Motors’ Chairman Ratan Tata has finally opted to abandon the manufacture of the small car, Nano, in the state. The end result has been that the opposition to the Singur plant, which was on agricultural land acquired by the state government, forced the Tatas to miss the Durga Puja deadline to give the country a car for Rs 1 lakh. Also the project to manufacture Nano has been driven out of Singur, which, in turn, is a serious setback to the state administration. Ratan Tata, who was recently ranked by Fortune magazine as one of the world’s 25 most powerful businessmen, refused to be cowed down by protests and political obstacles. Instead, he decided to move the Nano project to more hospitable terrain elsewhere. Although he was forced to go on the back foot on a few occasions by the protesters, led by the Trinamool Congress chief Mamata Banerjee, Ratan Tata chose to reply with an aggressiveness never seen before on the part of any of the corporate houses in the country. By deciding to move out of Singur, lock, stock and barrel, he has sent out a signal which every state government will also take seriously while seeking industrial investment. While accepting the loss of his investment in the venture in West Bengal Tata has shown steely resolve in refusing to allow his dream project to become a pawn in a political game. While looking for alternative sites in other states, the Tatas have already implemented their "Plan B" at Pantnagar in Uttarakhand which, till the time the new facility comes up at an alternate site, has become the hub of feverish activity leading up to the launch. The company officials were not ready to comment when the world’s cheapest car would hit the road now (it could happen late this year or early next year), but were sure that it will happen in the near future from an alternate plant. Tatas have already scouted out the sites being offered on a platter by the other states to relocate the Nano plant but now would be looking for a site which would provide the company with the factory with a capacity to roll out as many as 2,50,000 units scaleable to 3,50,000 units annually, an indication of the success which the Tata Motors is expecting the Nano to be. Earlier, they were expecting that by mid-2009 Singur plant would go into full production and would have, in other words, achieved the company’s ambitious target of selling 30,000 Nano cars per month. 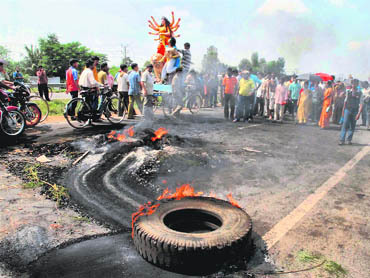 The protests incidentally, have done irreparable damage to the image of West Bengal, which has been trying hard to project the state as a place for investment not only from within the country but also from abroad. The Tatas’ actions have had reverberating effect on the industry on the whole with even some more of the upcoming projects being on the verge of being pulled out of West Bengal. However, as the saying goes, "every cloud has a silver lining". As a result of all the protests and global attention they attracted, the launch of Nano has become probably the most-awaited launch of a car around the world. And the company is all geared up to meet the rush for the history-making car, which many industry observers predict will be a huge hit in the emerging and advanced markets. On January 10 this year, when Nano (a Greek word, meaning dwarf) was launched at Auto Expo in New Delhi, it attracted attention of the world like no other social event in India has ever done before. The television channels in Europe and the UK aired a live telecast of the event and the launch was compared to seminal events such as the launch of Ford Model T and Volkswagen Beetle. It was the culmination of a dream which the Tata Group chairman Ratan Tata saw one fine morning while traveling to work. He noticed a typical Indian family — husband, wife and two children — traveling on a two-wheeler. He wondered if his company could create a safe an affordable all-weather car which could be a dream come true of this very family. And thus, the seed for the Rs 1 lakh car was sown. The announcement for the same came soon, shocking the world and forcing competitors to comment that it was all a sham and that such a project was not possible. But when Ratan Tata himself drove Nano on to the stage at the Auto Expo, causing almost a stampede, he forced all competition around the world to have a re-think. It was a "beauty" which would force even those in Detroit, world’s traditional automotive centre, also known as the Motor City or Motown, to sit up and wonder what would they do with their bulky, blazing vehicles. The petite Nano made Ratan Tata the cynosure of all eyes. "When I saw families riding on two-wheelers, it led me to wonder if we could create a safe, affordable all-weather car. Now, we are happy to present the People’s Car to India, which is affordable and yet built to meet safety requirements and emission norms" Tata said, adding "we hope it brings the joy, pride and utility of owning a car to many families who need personal mobility". The ripple effect of Nano has been so great that manufacturers around the world have been looking at focusing their attention on the small car. The rising oil prices have further induced confidence in the car manufacturers that investment in small car is the future even in the US, where the craze for big cars has been on the wane. Rival car manufacturers, including Fiat, General Motors, Ford Motor, Hyundai and Toyota Motor, have all expressed interest in building a small car that is affordable to more middle-class consumers in emerging markets. Back home Bajaj Auto says its $2,500 car, which it is building with Renault and Nissan Motor, will aim at a fuel-efficiency of 30 km/litre, or twice an average small car, and carbon dioxide emissions of 100 gm/km. The Bajaj venture will have an initial capacity of 400,000 cars, while Tata expects eventual demand of one million Nanos. Contrary to speculation that the car might be a simple four-wheeled auto rickshaw, the vehicle is "a properly designed and built car". Ratan Tata is reported to have said, "It is not a car with plastic curtains or no roof — it’s a real car." To achieve its design parameters, Tata apparently got involved in the design process and also refined the manufacturing process. He emphasised on innovation and sought new design approaches from suppliers. The car was designed at Italy’s Institute of Development in Automotive Engineering — with Ratan Tata requesting certain changes, such as the elimination of one of two windscreen wipers. Incidentally, Nano has 21 per cent more interior space and an 8 per cent smaller exterior, when compared with its closest rival, the Maruti 800. The Tatas know that marketing the world’s cheapest car will not be a cakewalk. While targeting a particular segment it would have to work hard to meet the growing expectations of this very segment. According to analysts of broking houses who have spoken to executives of Tata Motors, the company will be concentrating on setting up dealerships in small towns and rural areas across the country. "A number of dealers in two-wheelers are already talking to the company for dealerships," says an analyst with a major broking house. The Tatas are targeting two-wheeler owners to switch to the Nano. The company is specifying a minimum net worth of just Rs 50 lakh for aspiring dealers, among the lowest in the business. Among the innovations planned by the company is the setting up of compact showrooms at taluka headquarters and rural areas. These showrooms, owned by bigger dealers and their affiliates — measuring 600-800 sq feet — would be serviced by dealers from nearby cities and district headquarters. These small showrooms would probably have just one or two cars on display with cars shipped to buyers according to a waiting list. 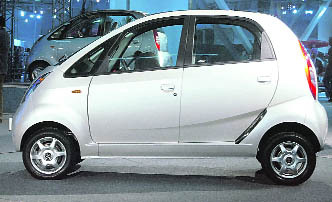 Already, the company has several upscale variants of the Nano in the pipeline to cater to more discerning customers "New variants of the Nano are also being developed to meet the new environmental and fuel price challenges, as also the market requirement of several international markets," Ratan Tata said at the company’s annual general meeting recently. With interest rates rising, Tata Motors is expected to come up with some easy instalment options. Group companies like Tata Finance are expected to announce competitive schemes while some private banks tie-up to finance the vehicles as well. According to Tata Motors, the Nano will seat four though three can squeeze in at the back. The cheapest version will conform to the minimum required legal specifications. The dashboard will have just a speedometer and an odometer. Besides the problems it has faced at Singur, it has faced criticism at the hands of environmentalists. They are concerned that its extraordinarily low price might lead to mass motorisation in countries like India and, therefore, possibly aggravate pollution and global warming as well as increase the demand for oil. R.K. Pachauri, chairman of the Intergovernmental Panel on Climate Change, said he was "having nightmares" because of this car and added that the car represents bankruptcy of India’s environmental policy. In the current policy and regulatory framework, the Centre for Science and Environment considers that the low-cost cars will be disastrous. This can change if renewable energies are used. Tata Motors is working with a French firm on using compressed air as fuel. However, there are others who are unperturbed by these angles. The ecology focused German newspaper Die tageszeitung feels that such concerns are "inappropriate" as the car has lower emissions compared to the average Volkswagen, and that developing countries shouldn’t be denied the right to motorised mobility when industrialised countries should be looking to reduce their emissions and usage of cars. Incidentally, the Tatas themselves are concerned about the Nano effect. It is said that in crowded metropolitan cities like Mumbai, Ratan Tata has conceived a scheme to offer the Nano only to those individuals who do not have an automobile already. While it is yet to be launched, Nano is reported to have also severely affected the used car market in India. The sale of new Maruti 800s have dropped by 20 per cent, and used ones by 30 per cent following the unveiling of the Nano. As an expert summarises; "People are asking themselves, why should they pay more than Rs 2.5 Lakh for a Maruti Alto, when they can get a brand new car for much less in a few months’ time, a car that is actually bigger". So it’s time to tighten seat belts for the "brand new revolution".